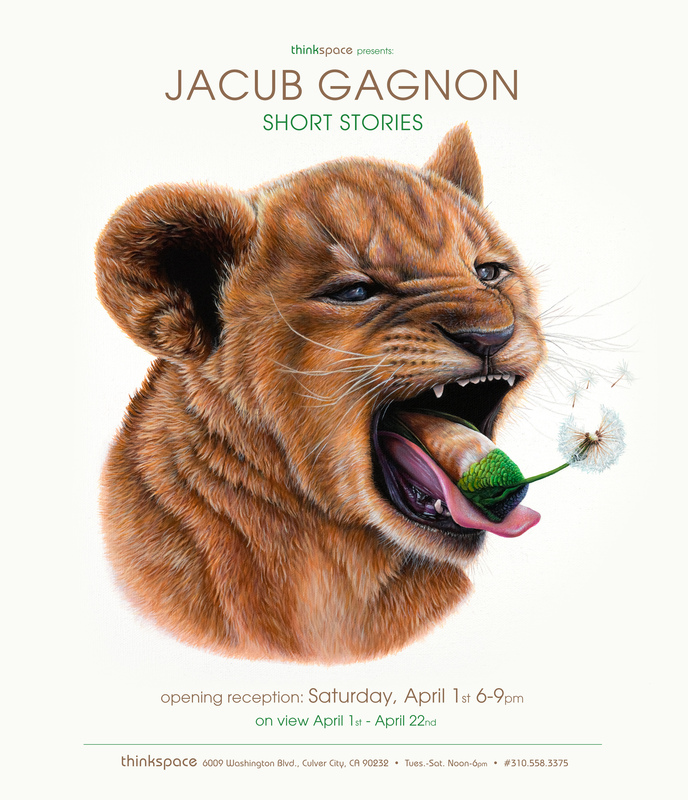 Thinkspace is pleased to present Short Stories, featuring new works by Canadian painter Jacub Gagnon. In the artist’s third solo exhibition with the gallery, Gagnon stages impossible sequences of the known. His works combine familiar elements like woodland animals and domestic objects in unlikely pairings to create wonderfully strange encounters and evocative juxtapositions. Pushing the natural world and the rules of its probability into the realm of the unreal and unnatural, Gagnon transforms the animal world into one of puzzling beauty and surreal interrelationship. Here, everything is enigmatically interconnected, subject to its own elusive order, and governed by attenuated physical laws where anything is possible. The human looms as a suggested presence in artifacts alone, shadowed in objects and traces, but ultimately remains outside of, and uninitiated to, this curious animal world. Known for these meticulous paintings of animals and objects, Gagnon creates limitless combinations, contingencies, and distortions of scale. 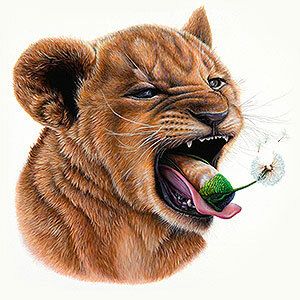 He achieves an impressive level of luminosity and detail with layered acrylic paints and the application of tiny brushes. The works feel hyperreal, thanks to their execution and richness of minutiae, dramatically lit from within through a spotlight approach to contrasting light. Subjects are usually rendered on dark black backgrounds and suspended in empty, nondescript spaces to sustain these moments of disbelief and contextual ambiguity. The dramatic lighting is undeniably theatrical and otherworldly, with the single directional flooding of light to contribute to the feeling of arrest. Strangely Baroque in their richness, jeweled tones, and contrasts, the paintings demand the viewer’s complete and rapt absorption. Recently, Gagnon has started to work on light or white backgrounds as well to create a different feeling of contrast and starkness, using negative, rather than blackened, space to isolate the subjects on the surface. Inspired by a stream of consciousness approach to language, Gagnon’s compositions often begin with words and associative vignettes which he forges into literal images; abstract ideas sprung from dreamlike recombinations of creatures and scenarios, ideas and stories. Whether giraffes tethered to tea cups, birds in armor, or wolves befriending deer, endless possibility reigns in this creative landscape of extended visual metaphor – unfettered by physics, common sense or the mores of practicality. The impossibility of these relationships remains a constant inspiration to the artist, fascinated by the perversely beautiful manifestations of the familiar transformed through the free association of the surreal. At times, the contortion of the probable and commonplace leads to moments of discomfort, aberration, and darkness, and at others to whimsy and playfulness. At times, freakishly beautiful, these worlds force the viewer to reconsider their own place amongst these fictions and, by proxy, to the unknowns of the natural world. Anything here is possible; magic is reality freed from law. In this new body of work, Gagnon continues to play with the suggestion of narrative and story, capturing concise moments of the unbelievable in each painting. Animals become vehicles for relatable human experiences, and each”short” suggests a part of a larger story and framework – a lengthier narrative arc just beyond the image frame. Inspired by the tradition of fairytale and its archetypes, Gagnon explores themes like family, encounters between friend and foe, love and loss, and the disruption and restitution of order. Like a world ecstatically unhinged, Gagnon’s imagination knows no limits or bounds. Here, anything is possible, and magic is a matter of course.